On its third album Norwegian black metal duo Immortal come into their own, and deliver their most conceptually complete recording. This third album takes the sound from “Pure Holocaust” and adds additional levels of speed, texture and density to it, without abandoning the atmospheric leanings of the band’s debut. 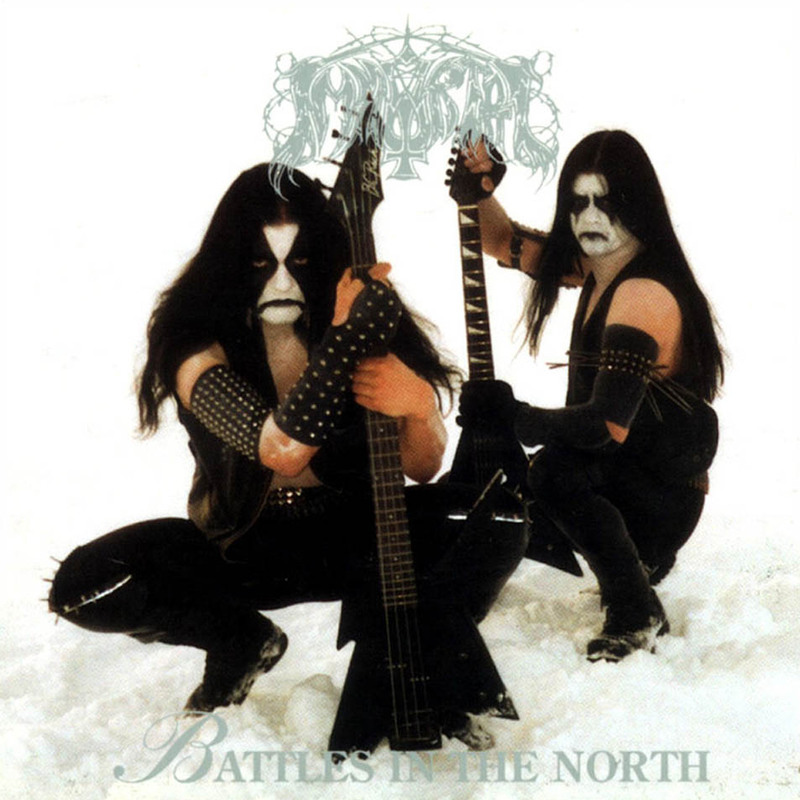 With a cruder production, an even higher tempo in playing and its fantasic Blashyrkh/winter, snow, ice concept worked out to a more detailed degree “Battles In the North” is in many ways the ultimate Immortal album. Released in 1995 it was one of the earlier releases in the Norsecore subset of black metal, and remains the duo’s best work by a long shot. This is Immortal’s most primitive and fastest album in a number of ways, it also their purest black metal one. The preceding two albums had minor death metal stylings, as would have the album following this one. Later in their career Immortal would up the German thrash metal architecture in their music, and become more of a thrash metal band than a black metal one in the process. However, “Battles In the North” is as atmospheric as it is unrelenting and crude. The atmosphere of Norse desolation, despair and darkness is conveyed through lyrics and Demonaz’ folk inspired melodies with only minor usage of actual folk instrumentation in but one track. Both Abbath and Demonaz deliver commendable work on the string instruments, although Abbath’s performance as a studio drummer for this session is considerably weaker compared to his work on the preceding “Pure Holocaust”. Whether this is to blame on part of the heavier but cleaner production I’ll leave in the middle. It’s one of the inherent charms of the record. The album is custodian to Immortal’s two most loved live staples ‘Grim and Frostbitten Kingdoms’ and ‘Blashyrkh (Mighty Ravendark)’, which themselves would be subject of a later VHS/DVD called “Masters Of Nebulah Frost”. Both embody two different sides of Immortal, and both are the best of those worlds. ‘Grim and Frostbitten Kingdoms’ is a fast cut, whereas ‘Blashyrkh (Mighty Ravendark)’ is a much slower, almost atmospheric and epic undertaking in tradition of ‘A Perfect Vision Of the Rising Northland’. The latter has a churning church organ, acoustic guitar playing and overall recalls “Diabolical Fullmoon Mysticism” in terms of construction and instrumentation, but not vocal style. There are other strong tracks to be found on this record, but these two by and large remain the signature tracks of this session, and will be forever identified with the band. Whereas the duo’s style was already minimalistic on “Pure Holocaust” here Immortal opt for an even more stripped down and barbaric approach. Taking the template from the preceding record and building further upon its initital framework “Battles In the North” sounds like a storm of frozen stormwinds that carry the sounds of battle. Forgoing an intro Immortal immediately break into the title track, and the crude production by Grieghallen Studio resident producer Eirik ‘Pytten’ Hundvin is the most crunchy yet charming the band had ever had at that point. The guitar tone is far thicker, as are the drums, Abbath’s bass guitar doesn’t feature as prominent as it once did, but there’s far more care put into vocal production. Overall “Battles In the North” is the duo’s best work with a stellar production and fitting imagery that complements the snow, frost, ice subject matter of their lyrics. Blashyrkh finally means something. As with the preceding album “Battles In the North” completes Immortal imagery. For the first time the duo had accumulated enough funds to afford a professional photoshoot and the album’s photography is nothing short of spectacular in all its goofy glory. The cover photo has both men kneeled in the snow holding their black guitars and bass, decked out in black metal uniform, complete with corpse paint, bullet belts and spikes. The back - and inner sleeve of the digipack feature an additional two or three different photos of the same shoot, all lyrics to the songs and the usual production notes and thank-you lists. Notable is that some of the lyrics contain spelling – and grammatical errors. Apparently Osmose Productions didn’t care enough to correct these faults for the final print, or to bring these to the band’s attention. It isn’t a big criticism yet a very valid one. Amateuristic things like this usually tend to hold the extreme metal genre back.